I was having a conversation with a colleague over dinner recently and an interesting topic came up: Fealty and veneration to the words and deeds of those who, to greater or lesser extents, helped define Lean management as we understand it today. My colleague said that such intense loyalty and deep respect bordering on the holy has unintended consequences that are harmful. Namely, people stop thinking. I think he is largely correct. Is it not odd that the “Lords of Lean” have awakened people and succeeded in getting them to think, yet it also caused most people to stop thinking. Their work, much of it published in book form, anchors followers. They do what the book says and recite the words as the final authority on the topic. In this way, they have stopped thinking. Who are the “Lords of Lean?” (assuming for the moment that Lean is synonymous with Toyota’s management system). That will depend on what you have read and whom among the living you may have personally interacted with. People like Henry Ford, Taiichi Ohno, Chihiro Nakao, W. Edwards Deming, Shigeo Shingo, Yasuhiro Monden, Masaaki Imai, Frank Woollard, James Womack, Daniel Jones, Jeffrey Liker, Art Byrne, Gary Kaplan, John Toussaint, moi… you get the idea. If we take their work as the final word, we close our minds instead of open our minds. We become fixated on them. They anchor us, which biases us against our own further growth and development. We don’t think we have the ability to do better. We don’t evolve. We don’t do a good job coaching and developing others. In the case of those who helped create the Toyota Production System, Taiichi Ohno is considered the Master. Yet, part of a Master’s teaching is to inform their disciples that they must take what they have learned and continue to learn and evolve. They must strive to go beyond Master’s teachings. This, of course, is a great challenge. The point, however, is not whether you succeed, but it is that you tried; that you put great effort into it over many decades. In almost every case that I see, effort is far more limited. People blindly try to replicate TPS and most get no further than where Toyota was in the early 1970s, despite all the consultants and all the books. Because that can be considered a great success, people slow down or stop. Yet, things change every day, and so there must be new ideas to try every day. Kaizen, continuation, and evolution are necessary. When kaizen stops, you stop thinking. People tend to miss these fine points in books. But they would recognize them if they continuously practiced kaizen and evolved their thinking. Instead of fealty or veneration, I believe what our greatest Lean/TPS teachers want most is for their disciples to put what they have learned into practice and to work honestly and diligently for many years. Much like a Zen master, the hope is that one day the student will surpass the teacher. 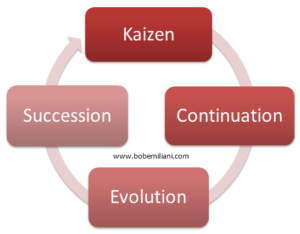 Kaizen, continuation, evolution, and succession. Position commands respect if it is earned. Higher stock price via laying people off, closing plants, squeezing suppliers, mergers, divestitures, financial engineering, etc., diminishes respect and negates fealty and veneration because anyone can do what they have done. Leaders such as these have not taught anything of value to anyone. They did not teach anyone how to think. If, instead, they did what Ohno-san had done, or better, then they too would realize that they have no use for fealty and veneration. The only thing they would have use for is kaizen, continuation, evolution, and succession. This is a very important blog for many companies to know and learn. (Volkswagon of America, Carrier)Unfortunately some companies have to learn the hard way. You make it very clear that as Deming said many years ago that the best companies sustain because they believe and practice what he called “the three legged stool” concept. This brings about proper balance in the company that is made up of management, share holders and workers. All three are stake holders in the company. Without the third leg of proper balance the stool and company will not stand very long. A list of public luminaries can’t encompass the contexts in which they flourished and taught. For one example, absent the conditions in post-war Japan Dr. Deming’s reception among Japanese industrialists might have been more like the one he had in the U.S. Very private Japanese industrialists, Toyodas in particular, deserve credit not only for embracing Deming but also for Taichi Ohno’s rise to greatness. The Lords operated in the right discreet kingdoms. It all boils down to one basic thing. How you quickly recognise and solve the root causes of problems. The methods to categorise and solve them are irrelevant. Puts one in mind of Eric Hoffer and his book The True Believer.